« Are you a Cattle Rancher or a Dairy Farmer? Recessions are good for people with jobs or money, because everything is on discount in the attempts to boost consumer spending. This means that that LCD TV that you have been wanting to get is now at a steep discount, saving you hundreds of dollars! Visiting Europe and US is now cheaper as the US dollar, Euro and Pound has dropped a lot since. Even the Aussie dollar is now weaker than the Singapore dollar. The rich will use this period to pick up distress properties and stocks and will make tons of money when the economy picks up again. A short recession may benefit them, but a prolong recession is not good for anyone. When will this recession end? 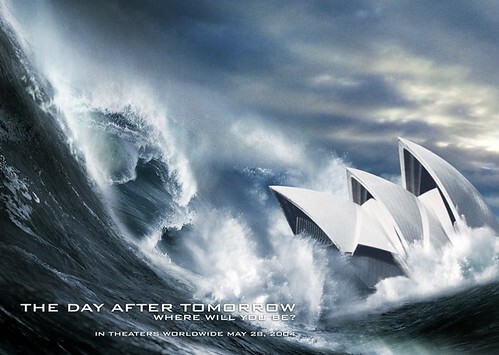 Remember the show The Day After Tomorrow, where tornadoes, tsunamis and such tore through America? It only stopped when nature regained its balance. Along the same lines, I personally feel that this recession will end when an equilibrium has been reached. Somehow, it doesn’t seem that near in the horizon. Where will you be, the day after tomorrow? Mr Baey said that local attractions such as The Flyer, should lower the ticket prices and offer more discounts to help boost consumer spending. 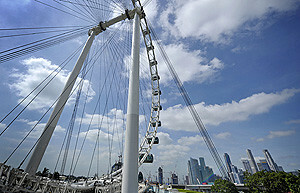 SINGAPORE attractions like The Flyer, the Zoo, museums and the Science Centre should offer more discounts and lower ticket prices to help boost consumer spending, said MP for Tanjong Pagar GRC Baey Yam Keng on Tuesday. He also urged hawkers to cut their prices and retailers to hold sales to move their inventory more quickly. Speaking during the debate on the Budget Statement, Mr Baey said it was important to stimulate the domestic economy. Commending the move by the public transport operators to reduce bus and train fares, he urged other businesses to follow suit. “Perhaps we can even slash ERP rates and TV licence fees just for one year,” he suggested. Market forces and policies to regulate traffic volume would continue but Mr Baey said the government could send a strong signal to encourage spending by slashing prices on public facilities. “Let us have a Great Singapore Resilience Sale,” he said. “If we are suffering a drop in income, if we want to cut our expenses, we must be prepared to make adjustments in our lifestyle,” said Mr Baey. COE PRICES continued to stay low yesterday, with premiums for cars costing as much as a year’s road tax in some cases. The premium for cars up to 1,600cc closed at $1,020, less than half the previous rate posted two weeks ago. Certificates of entitlement for cars above 1,600cc rose by more than three times – to end at $689. That is less than a year’s road tax of $740 for the ubiquitous 1.6-litre car. The Open COE, which can be used for any vehicle type but ends up mainly for cars, sank to a new low of $3,000 – from $3,200 previously. Barely six months ago, these COEs each averaged $14,000. And they were above $25,000 less than six years ago. The weaker demand was attributable to growing uncertainties on the back of the economic slowdown, as well as the long Chinese New Year break which saw many dealerships closed. Business was reportedly brisk when showrooms reopened last week. Dealers wooed buyers with bargain prices such as $37,000 for a 1.6-litre Hyundai Avante and $45,000 for a 1.5-litre Toyota Vios. But orders did not exceed the supply of 4,430 COEs by much. According to the Land Transport Authority, the bids-to-quota ratio remained weak at yesterday’s tender, with only 1.25 bids for every available COE. Mr Ron Lim, general mananger of Nissan agent Tan Chong, said there were still ‘a backlog of Open COEs’ – some fast expiring – in the market. ‘So a lot of orders may be cleared with these Open COEs,’ he said, explaining why the apparently brisk sales did not lead to higher premiums. Dealers are expected to lower car prices after yesterday’s tender. Tan Chong said it would probably cut small car prices by $1,000, while Suzuki agent Champion Motors has already started reductions. The Suzuki Swift Sport, for example, now starts at $49,900, down from $52,900. Meanwhile, the COE premium for commercial vehicles ended at $2,590, from $2,900 before. And the motorcycle premium closed at $701, from $900. Don’t surprise the old folk! This entry was posted on Thursday, February 5th, 2009 at 12:43 pm and is filed under Money Saving Tips, Singapore Watch ver 2.0. You can follow any responses to this entry through the RSS 2.0 feed. You can leave a response, or trackback from your own site.